From left, Abdel Isakovic, Kenneth Evans-Lutterodt, John Warren, and Aaron Stein. 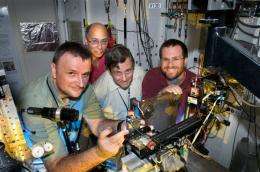 (PhysOrg.com) -- A team of Brookhaven and Argonne National Laboratory researchers has demonstrated a reliable path for sculpting an intricate x-ray focusing lens out of diamond. Their technique, which was published in the January 2009 edition of the Journal of Synchrotron Radiation, could prove extremely valuable in the study of nanomaterials at future synchrotron light sources. Kinoform lenses, a type of refractive lens similar to those found in lighthouses, are being considered by researchers for their ability to efficiently focus x-ray light down to very small spots. This feature is vital to the study of molecules, atoms, and advanced materials at the nanoscale - on the order of billionths of a meter. Typically, kinoforms are made from silicon, a material that is easy to shape, but not ideal for handling the intensified photon beams at upcoming synchrotrons like Brookhaven's National Synchrotron Light Source II (NSLS-II). "The next generation of light sources will generate a higher energy density than the NSLS, and therefore, beamline optics will 'feel' a lot more heat," said NSLS postdoctoral researcher Abdel Isakovic, the lead scientist on the study. "We need to find the right kind of optics to handle this heat load." Because of its very high thermal conductivity and transparency to x-rays, diamond is an ideal candidate for the job. The problem is its extreme hardness, which makes it very difficult to etch the kinoform's saw-tooth shape. "These funny-looking patterns are not easy to make in silicon, much less in diamond," said NSLS physicist Kenneth Evans-Lutterodt. The structure of a kinoform lens: (a) single, 11.2 keV kinoform refractive lens made from optical quality artificial diamond using e-beam lithography, metallization, and deep reactive ion etching; (b) a detail (a central portion) of such a lens shown from the tilted perspective of an incoming x-ray beam. In order to transfer the kinoform pattern from a numerically generated plate, researchers chemically remove the layers of the material that aren't "masked," or made resistant to the etching process. Diamond etching is difficult because the material itself is resistant to many commonly used chemicals. But through a pulsed, cyclic method with oxygen-argon plasma and artificial diamonds - a cheaper version that still maintains the hardness of the real material - the researchers found a way to etch a clean kinoform pattern deep into the diamond at Brookhaven's Center for Functional Nanomaterials (CFN). The lenses were tested on an x-ray beamline at Argonne's Advanced Photon Source (APS). Among other measurements, the team found that the spot size produced by a single diamond lens is about one micrometer, still a ways off from the one-nanometer benchmark desired for future synchrotron studies. But multiple kinoforms can be stacked one after another to form a compound kinoform lens, which produces a much smaller spot, Evans-Lutterodt said. In addition, compared to compound kinoform lenses made from silicon, the compound diamond lenses showed better light transmission and will work in a broader energy range. "This is an early result, but we've showed that it works and provided a path toward developing nanofocusing optics," Evans-Lutterodt said. "Now there are a number of things that we could and are improving." Although the diamond etching was mostly very clean, the team observed parts of the pattern that were inadvertently etched away. The resulting challenge is to find a more selective mask that will better protect these features. In addition, the group will start using near single-crystal diamond samples (provided by Carnegie Institute of Washington), which were found to have fewer defects and show promise for better-quality x-ray optics. "The benefits of perfecting this diamond nanofabrication technique go beyond x-ray optics," Isakovic said. "It could be used in everything from special-purpose diamond electronics and spintronics to devices needed in future accelerators." Other authors involved in this work include Aaron Stein and John Warren (Brookhaven), and Suresh Narayanan, Michael Sprung, and Alec Sandy (Argonne). More information: A.F. Isakovic, A. Stein, J.B. Warren, S. Narayanan, M. Sprung, A.R. Sandy, K. Evans-Lutterodt, "Diamond Kinoform Hard X-ray Refractive Lenses: Design, Nanofabrication and Testing," J. Synch. Rad., 16, 8 (2009). The half-pitch resolution of the kinoform lens is the same as the smallest half-pitch on the kinoform itself.